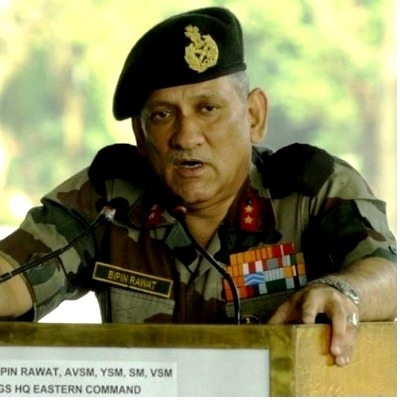 New Delhi, May 10: Azadi [freedom] is not possible as “we will always fight those who seek Azadi”, this was by Indian Army Chief General Bipin Rawat in a message to Kashmiri youth. Notably, while giving an interview to Indian Express General Bipin Rawat said that the security forces haven’t been so brutal and asked the Kashmiri youth to look at Syria and Pakistan and see how they are using tanks and air power in similar situations. However, he also expressed concern over Kashmiri youth picking up the gun and said they were being misled to believe this path will bring Azadi. “I want to tell Kashmiri youth that Azadi isn’t possible. It won’t happen. Don’t get carried away unnecessarily. Why are you picking up weapons? We will always fight those who seek Azadi, those who want to secede. Azadi is not going to happen, never,” he said to Indian Express. On the number of terrorists being killed in the gunfights, he said, “These numbers don’t matter to me because I know this cycle will continue. There are fresh recruitments happening. I only want to stress that all this is futile, nothing is going to be achieved by them. You can’t fight the Army”. Gen Rawat further said that he is upset by the killings. “We don’t enjoy it. But if you want to fight us, then we will fight you with all our force. Kashmiris have to understand that the security forces haven’t been so brutal, look at Syria and Pakistan. They use tanks and air power in similar situations. Our troops have been trying their level best to avoid any civilian casualty despite huge provocation,’’ he added. The Army Chief also said, “I don’t understand why people are coming out in huge numbers to disrupt our operations. Who is inciting them? If they want that the terrorists aren’t killed, they should go and tell them to come out without their weapons so that nobody is killed.’’ “Let anyone of them say mein le ke aata hun and we will halt our operation,” he added. General Rawat also noted that that the youth by pelting stones on security forces them are inciting them to become more aggressive. Further, General Rawat s also noted that he understands that there isn’t a military solution to this issue. “This is why we want politicians, political representatives to go into villages especially in South Kashmir to talk to people. But they are scared that they will be attacked,’’ General Rawat added. The Army chief said, “It will happen once there is calm. And we are hopeful that people will soon realize that all this is futile and start thinking differently”. He further stated that he is ready to suspend military operations to avoid civilian casualties. “But who will guarantee that there won’t be fire at our men, at our vehicles? Who will guarantee that policemen, political workers, our men returning home on leave aren’t attacked, aren’t killed?’’ he asked in the end.